Sydney knows that sometimes is just too much work to sift through Sydney's blog looking for all her great writing and publishing wisdoms! 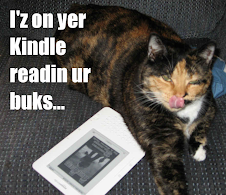 Sydney also knows that sometimes you might want to read Sydney's great writings without having the internets! Sydney's book is also available on Nook, Smashwords and other ebook outlets! GO! 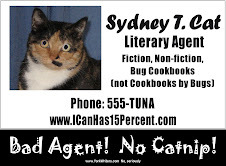 Bad Agent Sydney wants to hear from YOU! Please leave your queries, questions, or comments! Perhaps Sydney's response will inspire a future post! While Bad Agent Sydney is not taking on new clients at this time, she is well aware that ALL WRITERS NEED CAT SUPERVISION! Little known fact that this instinctive talent that ALL cats have! Writers (and everyone want to be writer! ), do to local shelter and ADOPT HOMELESS KITTY TODAY! Use this LINK to find shelter near you! GO! AGENT SYDNEY SAYS! If you found this post useful or fun, please be aware that Sydney has NEEDS! Toys. Catnip. TUNA! Support Sydney (and her people) by digging deep and sending a "thank-you" donantion her way. PURRRRRRRRRRRRRRRRRRRRRRRRRRR! (You cannot resist my hypnotic "pay up!" purr! PURRRRRRRRRRRRRRRRRRRRRRRRRRRRRRRR!